This is a campaign to the flight passengers arriving at Ibaraki Airport, who will stay overnight or more at accommodations in Ibaraki and are renting a car on the arriving day. In this campaign, the basic rental fee for the first 24 hours will be lower than usual. Please take advantage of this opportunity. Free to leave in Ibaraki prefecture within 48 hours! All cars with car navigation system! 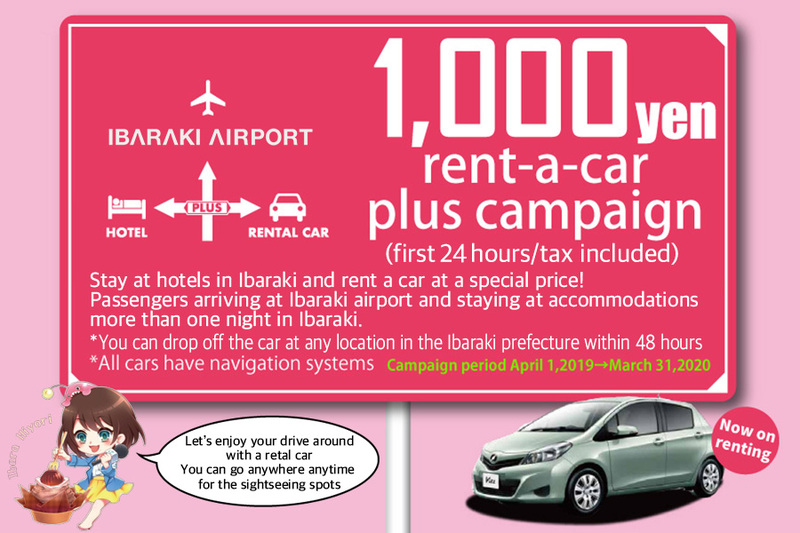 During the campaign period, if you use arrival international flight at Ibaraki airport and stay at accommodations in the prefecture one night or more, you can rent a car at the campaign price! ⑥	Cars borrowed and returned in the period are subject to campaign. 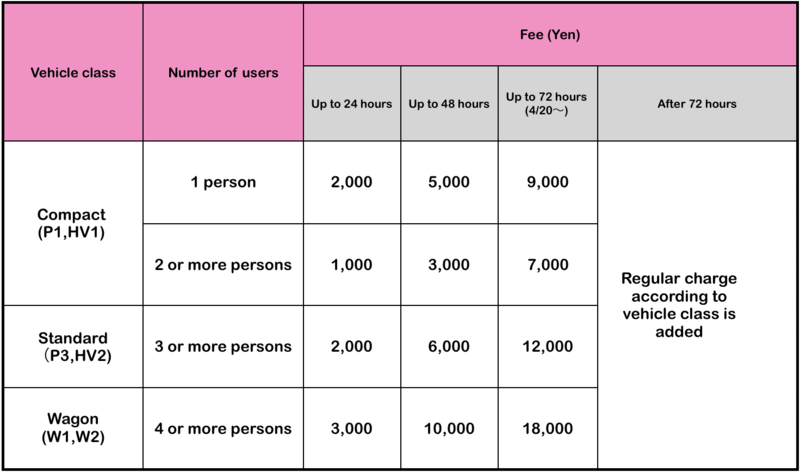 Regular fee after 72 hours. Model designation and optional fee etc. are required separately. Those who arrive at Ibaraki airport on international flights, stay at accommodations in Ibaraki prefecture one night or more and rent cars at Toyota Rental & Lease Ibaraki Airport shop on arriving day. (Starting from 4/20)To apply for campaign fee for up to 72 hours, you are required to stay at accommodations 2 nights or more in Ibaraki prefecture and return cars to Toyota Rental & Lease Ibaraki Airport shop. You can pick up a car exclusively at Toyota Rental & Lease Ibaraki Airport shop. If you drop off the car at the same shop at Ibaraki Airport or any other branch shop in Ibaraki within 48 hours, the drop-off fee will not be charged. If you return the car to another branch shop outside Ibaraki, an extra drop-off fee will be charged and you are not eligible for this campaign. Basically, to rent a car, booking online or by phone in advance is necessary. Reservation on other than TOYOTA Rent a Car official Website will be excluded from this campaign. As 1000 YEN RENTAL CAR PLUS CAMPAIGN is provided only at Ibaraki Airport, campaign prices are not reflected on the on TOYOTA Rent a car official Website. If you book on the Internet, please make reservation at normal price and notify that you applied for the campaign when renting a car at the counter of Toyota Rent lease Ibaraki Airport. You can’t pay for the rental fee by using travel coupons. If you use the rental car exceeding the campaign period, extra fee will be charged. The cost of car insurance and other options should be paid separately besides the basic fee.For more detailed information, please contact the rent-a-car company below. We provide the video about some important points for safety drive in Japan. There is an explanation about Japanese driving rule. Please tell us you are 1000yen rental car campaign users at the counter of TOYOTA car rental shop at Ibaraki airport. There is only normal rental car rate on our website, when you reserve the car rental. This special campaign provides a service only at TOYOTA rental car in Ibaraki airport.